“We will not rest until this well is shut, the environment is repaired and the cleanup is complete.” Such were the oft cited words of Barack Obama regarding his commitment to the people of the Gulf coast following what became the largest oil spill in the history of the United States. But now the “damn hole is plugged,” and the First Family will soon be off to Martha’s Vineyard for a much needed vacation from entertaining Paul McCartney, trips to Spain, to Maine, and countless golf outings. Will the rest of America follow their example and forget about the damage done and the damage remaining? The impact on the economy and people of the Gulf Coast following the disastrous explosion of Deepwater Horizon was immediate and devastating, and is ongoing. Forecasts and reports of oil covered beaches along Alabama’s “redneck Riviera” and the Florida panhandle had an immediate effect on people’s summer vacation plans. Videos of workers patrolling the beaches in HAZMAT suits replaced pictures of pretty girls in bikinis, reinforcing the impression that the beaches were covered with oil and tar balls and were a health hazard. Trips were cancelled, hotel rooms and condominiums sat vacant, and restaurants were empty. Merchants who depend on the summer tourist trade were left with nothing but generally clean beaches, reams of paperwork with which to file claims against British Petroleum for their lost revenue, and a sense of dread that they might not be able to hold on in anticipation of a hopefully better season next year. At the same time, fishermen in south Louisiana were unable to ply their trade, as the waters they troll for fish, shrimp and oysters with which to supply a significant portion of America’s appetite for seafood, were closed. Sport fisherman cancelled charters, and charter boats sat in marinas with no customers. Commercial fishermen offered their services dragging boom to protect the coast, but there wasn’t enough boom to go around. Then as if to add insult to injury, the Obama administration imposed a six month moratorium on “deep water” offshore drilling which has trickled down to impact shallow water drilling permits as well. Despite having been overturned in federal court and rebuked by the very scientists and engineers who were cited as supporting it, the moratorium stands. Drilling rigs are leaving the Gulf, unlikely to return for years. While existing production wells continue to operate, as the wells are depleted they, too, will be shut down, with no new ones to replace them. Those who work on the rigs and wells, as well as the satellite businesses that support them, will find themselves looking for alternatives to the jobs they’ve known for years as the oil industry in the Gulf dies. Unfortunately, much of that which was reported was grossly overstated, if not completely false. Forecasts of oil slipping past the tip of Florida, getting caught up in the Gulf Stream, and “covering” Atlantic Coast beaches as well, have been rescinded. While waters were closed to commercial and sport fishing, thousands of square miles of the Gulf were never closed, and the seafood harvest has continued, though not unabated. Shrimp or oyster po-boys are still available in abundance, and there have been no reports of tainted seafood. And while there were occasional beach closures in Florida and Alabama, they were the exception and not the rule. But the irresponsible media had done its damage. Panicked people quit buying seafood, and vacationed elsewhere. Then this week we began hearing reports that the magnitude of the spill and the anticipated magnitude and longevity of its damage had been similarly overstated. Things aren’t that bad, folks, and the crisis is over. The National Oceanic and Atmospheric Administration, the same organization that predicted oil on Atlantic beaches, reported that 75% of the spilled oil was “gone.” A recent estimate, one of many, suggests that 4.9million barrels of oil was released, and that 25% of it was removed (5% burned, 17% recovered at the wellhead, and 3% skimmed), 25% evaporated or dissolved by natural means, and 24% was dispersed (16% naturally, 8% chemically), leaving “only” 26% on shores, in marshes, or still on / in the water. Great news! BP immediately announced that they were scaling back their recovery efforts. Much whooping, hollering and congratulatory back slapping was heard coming from the West Wing. Crisis averted by the hard work and diligence of the White House. Time for a vacation! Where did the oil go? Does the answer offer a precursor to where the rest of it might go? 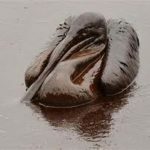 The National Research Council has estimated that over 41million gallons of oil naturally ooze from the earth’s crust under the Gulf annually, and biological organisms have developed there to consume it. With an additional abundance of BP’s oil, those same “bugs” are now consuming oil at an escalated rate, making baby “bugs” in their spare time, and generally being fat, dumb and happy until they expire and enter the food chain for other sea dwelling creatures, thus helping to restore the turtle, shrimp, fish and oyster populations as well. Generally, the Gulf of Mexico can be, and has been, described as a very “resilient” environment. Consider, as did Seth Borenstein and Cain Burdeau of AP, that the Mississippi River discharges an enormous amount of water into the Gulf every minute, bearing much of the agricultural and urban waste of the large region of the country that it drains. That the Gulf contains an ecosystem to address and clean up waste should be of no surprise. It already has to contend with that river discharge and the dead zone created by excess fertilizer runoff, the nitrogen from which encourages the growth of algae which is consumed by bacteria which also consume most of the oxygen and leave insufficient amounts to support most other forms of life – a problem that has grown considerably since midwestern farmers are trying to grow more and more corn from which to produce environmentally friendly, renewable “green” ethanol, which isn’t so environmentally friendly to the Gulf. It has to contend with hurricanes churning it up and scattering its many life forms, and it has to contend with the aforementioned, naturally occurring oil oozing from beneath its surface. But that’s not to suggest that all is well with the Gulf, and that she’ll take care of the oil spill, too. Much of the coastal oil is in Louisiana’s marshes, which are no longer adequately protected due to the erosion of her barrier islands. That erosion was accelerated, before we became adequately aware of the consequences of certain actions, by harvesting of cypress and tupelo forests, draining of the land for farming, and the cutting of canals to ease the exploration and production of oil and gas. Hurricanes Katrina, Rita, Gustav and Ike added to the damage, as did the current economic crisis, which curtailed the availability of funds for restoration. There are also indications that some of the oil didn’t disappear after all – it’s just hiding. John Snell of WVUE in New Orleans has filed a piece revealing that in several areas along the coast of Plaquemines Parish, observers noticed that when they stepped near a burrow hole from hermit crabs, oil percolated to the surface. Shallow excavations revealed pools of oil just a few feet below the surface of the beach. So perhaps things are not as good as recent announcements would lead us to believe, just as they were not as bad as we were encouraged to believe during the height of the spill. Yet we’re still left wondering how much less severe the damage might have been had the federal government not been so “helpful.” Recall that skimmers were kept out of the Gulf for an intolerable length of time because the effluent they discharged contained more than the EPA allowed 15 parts per million (ppm) of oil. Would not 20 ppm have been better than a million ppm? Recall as well that foreign offers of assistance were rejected because to accept them would violate the Jones Act protecting domestic unionized merchant mariners. Temporary barrier island “berms” were delayed and never fully authorized to protect the marshes in order to study the environmental impact of building them, and we’re left with the environmental impact of not building them. Then when limited dredging for their construction was approved, there were further delays while the Coast Guard inspected the dredges for an adequate supply of life jackets and fire extinguishers! Offers of protective boom, inventoried in Maine by a company willing to make more if they could obtain an infusion of capital by selling that inventory, were rejected because their end connections didn’t mate with the connections on the boom in place. Could it not have been sequestered and only used with boom of the same manufacture? a seafood industry that can’t fully get back to work due to damaged and restricted coastal waters, and a public perception that their harvest isn’t safe to consume. a tourism industry suffering major economic devastation due to the loss of a year’s income. wetlands still soaked in oil with no adequate technology or natural ecosystem to remove it. a moratorium on deepwater exploration that is eliminating thousands of jobs, is transferring the wealth of this nation to George Soros and other Obama supporters who are heavily invested in exploration programs in other countries, and will increase our dependency on oil from other nations, many of whom have declared us their enemy. an increased exposure to disasters of this scale and greater as oil production shifts to nations that are much less safety and environmentally responsible than is the United States. an increased exposure to disasters of this scale and greater as more and more oil is transported here in tankers that history shows are much more likely to experience spills than are drilling platforms. How will the nation and the world respond to yet another prolonged disaster in Louisiana and on the Gulf Coast? Now that Macondo is capped and the cement is dry, media coverage is already diminishing, and what coverage remains is rejoicing (as are we) that the disaster is smaller than was originally estimated, while downplaying the ongoing, long term damages. Will the nation and the world follow the example of President Obama and the First Family, by congratulating itself for a job well done, celebrating another crisis concluded, and taking a vacation? The crisis is not concluded. 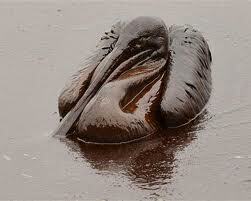 The Gulf oil spill may soon be forgotten, but it will not soon be gone. Next Article There’s Freakin’ More!